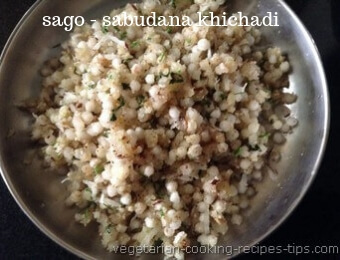 Sago Sabudana khichadi recipe is made from sago or tapioca pearls. It is a popular Indian recipe in Maharashtra, Gujrat, Karnataka, Rajsthan. Sabudana khichdi is a easy breakfast recipe. It is also vrat - upvas - fasting recipe made during Navaratri, Shivratri. Sago is known in Indian languages as sabudana/saboodana(Hindi - Marathi), seeme akki, sabbakki(Kannada), javvarisi (Tamil), saggubeeyam(Telugu) etc. Sabudana khichadi is made for breakfast, as a filling snack, or for a vrat or upvas meal. It is made during Navaratri or Sankashti Chaturthi fasting. Sago or tapica pearls cook very fast but you need to soak it for an hour or so. You may also make sabudana kheer with sago. 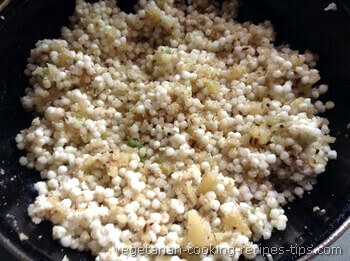 About minimum 2-3 hours of preparation/soaking time is needed for making sabudana khichadi. We need to soak sago well before cooking. The amount of water we soak the sago in is important. Too much will make sabudana mushi and too little will not soak it well. Add sabudana to a bowl. Add some water and wash well. Remove all the water. Add 2 tbsp water and leave the sago to soak for minimum 2 to 3 hours. Soaking longer / overnight is good too. Grind the roasted peanuts to coarse powder consistency. Chop the potato in thin pieces. You may peel it or not according to your choice. After the sabudana has soaked for minimum 2 hours, separate the grains lightly with your fingers or a spoon. Add the groundnut powder, salt, sugar to it and mix well and keep aside till cooking time. 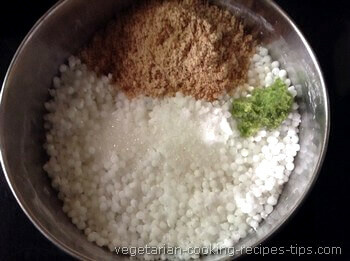 You may do this mixing just before cooking khichadi too. I have added some green chili paste. Heat oil/ghee in a kadai/pan. 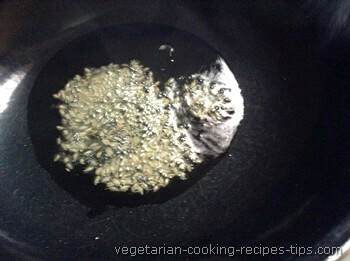 Add jeera (cumin seeds). 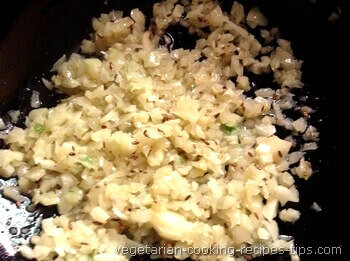 Let them splutter and then add the chopped green chilies (if adding). Stir for a few seconds. add chopped potatoes. stir and cover. Let cook for about 2 minutes on low flame till potatoes are just cooked. This is how potatoes will look after being cooked, in the image below . add the sago mix and stir well to mix properly. cook for 2 minutes stirring often. You may cover and cook for a minute. Do not cover for too long. Sago grains may become sticky. Switch off the flame. 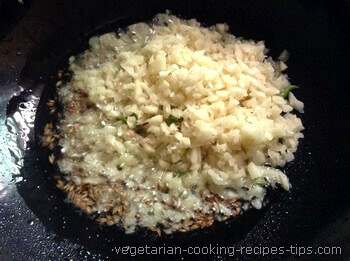 Add fresh grated coconut, coriander leaves and lime juice. mix well. Or you may add coconut, coriander leaves as a garnish while serving and serve with a lemon wedge. 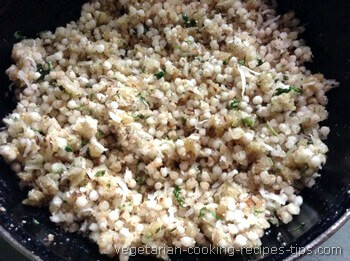 Sabudana khichadi tastes great as a hot breakfast or even as a cold dish. A good dish to take for lunch too. Soaking time is a must. Add water carefully. Do not add too much in the beginning. After soaking for an hour, if any water remains, pour into a colander so that all excess water drains away. We want each sabudana grain soaked but separate when mixing with groundnut powder. You can keep soaked sabudana in the fridge for 2-3 days. Khichadi keeps good in the fridge for 3-4 days. Just reheat before serving. 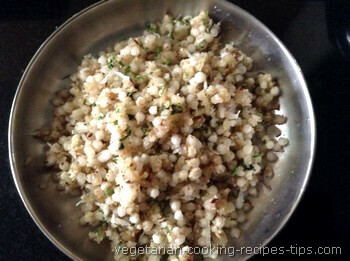 Leftover khichadi can be used to make sabudana vada or sabudana thalipit.